Trinity University had been located on three different sites already when, in 1945, the school found and bought its promised land: an abandoned limestone quarry four miles north of downtown San Antonio. The quarry’s uneven topography and littered condition made it an unlikely site for a university campus. Economy trumped ease, however, for the board of trustees, and then-President James W. Laurie bought the site with high hopes of it becoming the university’s permanent campus. 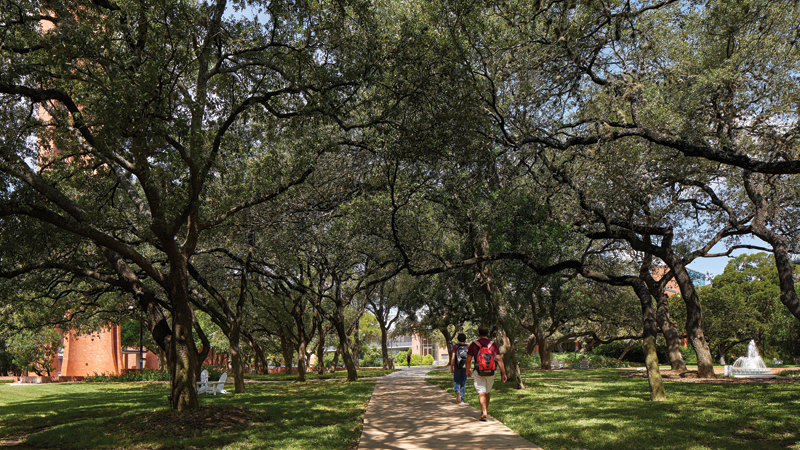 They hired Bartlett Cocke and Harvey P. Smith to design a campus that would solidify Trinity’s status in San Antonio, but once again the more conventional path forward was the more expensive one. When the architects proposed a plan in the traditional Georgian style and called for leveling the quarry, the board found it too costly. They recommended a more functional style that utilized nearby resources. It was at this point that the man who would become the standard bearer of Texas regional modernism stepped in: O’Neil Ford. Ford had already made a name for himself with projects such as the Little Chapel-in-the-Woods in Denton and the restoration of La Villita in San Antonio when he joined the architectural team for the Trinity project in 1948. With his experience, Ford brought an immaculate vision for architectural and spatial potential. Where the other architects saw a decrepit and troublesome site, Ford saw an organic and intimate campus sprawling across a rocky hillside like a low-lying Italian village, offering some of the greatest vistas of downtown San Antonio in the area. Over the next three decades, that vision would be realized under Ford’s careful and considerate eye. Now, 70 years since Ford came to Trinity, his campus has received a national historic designation with the help of Page. The architecture firm has been working closely with Trinity alumni, faculty, students, and staff since 2015 to create an architectural master plan that will honor the legacy of Ford’s design while planning for future innovation and development. In working with the Trinity community on the master plan, Page saw an opportunity for the school to decisively preserve Ford’s innovative and integrated architecture on campus by seeking out a national historic designation. “The fact that you have this collection of midcentury modern buildings that is so cohesive — and the fact you have it done by one architect, and you get to witness one architect’s career trajectory over the course of three decades in one location — is fairly significant,” Losch says. Page got in contact with Stan Graves, FAIA, of Architexas to walk the master plan committee and the university board of trustees through the historical designation process, and after obtaining their approval, he began to draft the nomination. 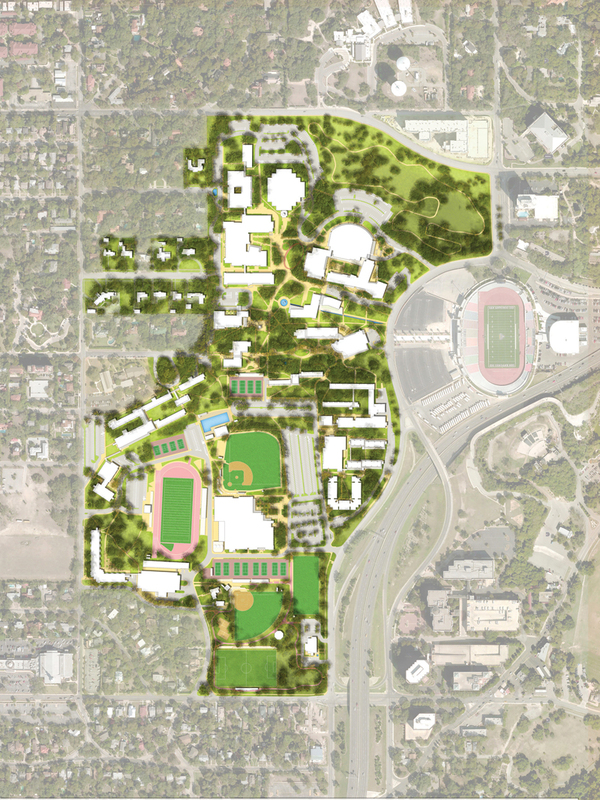 The process of seeking designation went hand in hand with the design of the master plan and testifies to the university’s and the architects’ dedication to transparent and collaborative decision-making. The common theme of the discussion was the tug-of-war between preservation and innovation. “There’s always a segment of people who want to freeze everything exactly as it is or was,” says Diane Graves, Trinity’s university librarian emerita and chair of the campus master plan committee. However, there was also a group who wanted to be sure there would be flexibility for change when necessary. Stan Graves explained how national historic designation could appease both groups by protecting the essential Ford-designed aspects of buildings while allowing nonessential aspects — such as certain interiors — to be modernized when necessary. 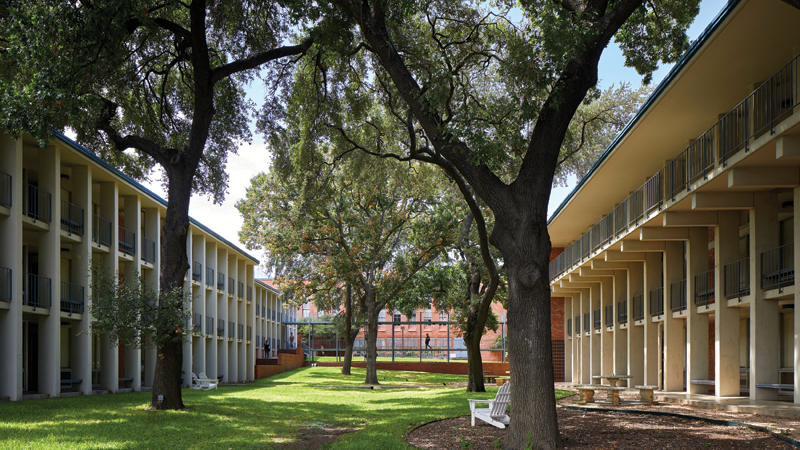 Additionally, Graves said the primary merits of designation are that it opens the university to state tax credits, which could fund future projects and improvements, not to mention “the honorific potential behind the designation,” since Trinity is now one of only three campuses from the 1950s with a historic designation. Walking around the Trinity campus, one clearly sees how the university leadership’s dedication to careful architectural consideration, preservation, and innovation is an extension of Ford’s vision. 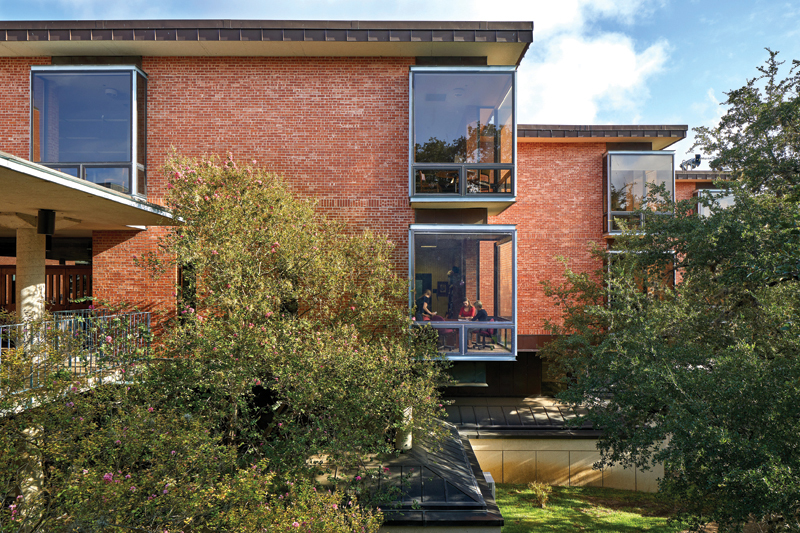 The architect thoroughly considered all aspects of design — site, scale, materiality, relationships — to create a coherent, intimate, and welcoming campus. Rather than leveling the quarry before building, Ford deftly crafted low, horizontal buildings to be situated onto and into the quarry escarpment, producing an organic flow of movement between what would later be called upper and lower campus. The buildings maintain uniformity of scale and materiality — two- to three-story buildings and “Bridgeport pink” brick — that make the campus cohesive rather than monotonous. Ford’s ability to leverage the site so that each building and pathway provides a distinct view of campus also wonderfully juxtaposes the uniformity of the facades and creates additional dynamism. a small liberal arts university. Other aspects of the master plan include improvements such as developing a more streamlined corridor through the core of the campus, establishing a clearer university entrance, and rehabilitating the interiors of the oldest buildings. Christiana Sullivan is a journalism student at UT Austin and a summer editorial intern at TA. Very interesting history of the campus. Did not know it was sited on a former quarry; it explains the vertical paths. Always felt I was attending a beautiful school, and the cohesiveness of the architecture made it more so. Had attended summer school at other colleges that had ad hoc architecture with various styles, and their campuses were diminished by a lack of a clear vision. After Trinity, I attended Pratt Institute and studied design making the built environment my life’s work. Our environment is very important, And, Trinity provided a wonderful learning environment. And, a thank you to Trinity’s Elizabeth Ridenhower for her guidance in showing me my life’s path.